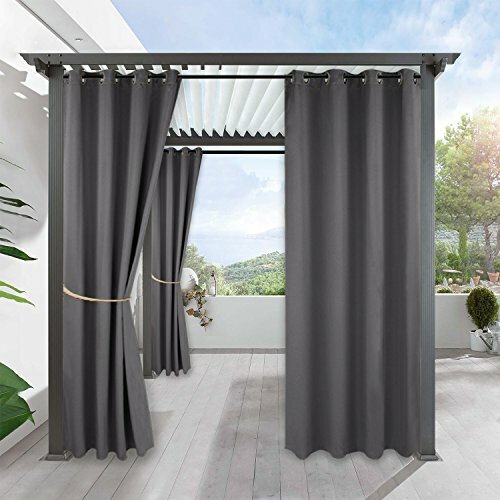 RYB HOME Indoor Outdoor Grommet Blackout Curtain Panel decor your Home, Patio, Lawn & Garden with upmost elegeance.DETAIL INFORMATIONSold as 1 panel only, mesuring 52" width, available in 84", 95" 108" length.5 colors for choose: Grey, Brown, Greyish White, Mocha, Cream Beige.Made of 100 % high quality soft polyester.Each curtain panel with 8 silver grommets (inner diamter is 1.6"), universal fit to most of rods.KEY PRODUCT FEATURESMildew resistantFade resistantWaterproof effectSlive Rust Proof GrommetsRYB HOME Curtains panels are handy to use in the outdoors indoors conditions. 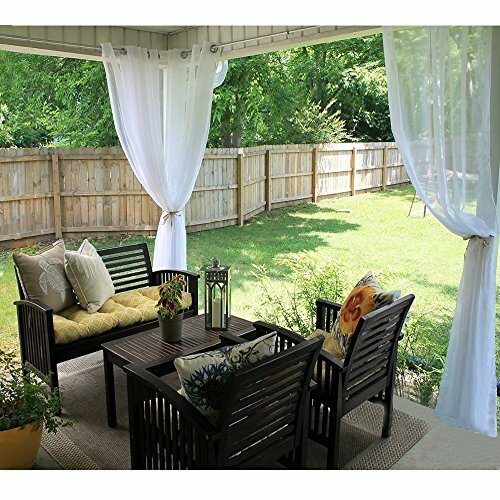 All these features make the curtains durable and high-end.PERFORMANCE & PRIVACYHeavy duty material with triple weave technology block 85-95% sunlight & UV rays and provide privacy from neighbors.Perfect for patio, pergola, gazebo, porch, backyard, country, garden, wedding....EASY TO MAINTIENMachine washableQuick ironying or steam cleaningHINTSRYB HOME is always looking forward to serving our clients with warmth and full ranges of services. Please do not hesitate to contact us if you have any queries. OVER ALLImpress your friends, family and guests with NICETOWN Indoor /Outdoor Solid Grommet Sheer Curtain Panel.These simple yet elegant panels are a nice finishing touch to any outdoor extension of your home.FEATURESLight filtering: ★★★★★Water Proof: ★★★☆☆Mildew Resistant: ★★★★☆Fade Resistance: ★★★☆☆These 54 inch wide drapes come in 84, 96 and 108 inches long, offered only one color. The fabric is sturdy and soft on the touch. Hand pressed rust proof grommets fit the curtain rod of your choice up to 1.9 inch in diameter. 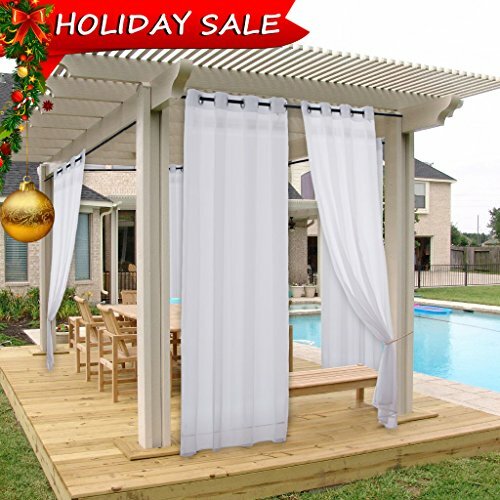 Perfect for front porch, pergola, cabana, covered patio, gazebo, dock, beach home and so on.OUR BRANDInvite NICETOWN products into your home for their form and function, and experience their style, craftsmanship, and value. We travel the world to find the best materials and designs for our products and use the most sensible manufacturing methods. We thoroughly test each NICETOWN item and rely on feedback from our customers to help us deliver the highest quality. With a selection that continues to grow, the NICETOWN brand is set to become a game changer in your shopping cart and part of your lifestyle. 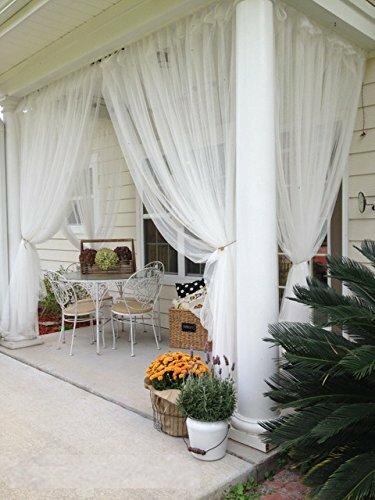 RYB HOME Indoor Outdoor Grommet Sheer Curtain decor your home with upmost elegeance.DETAIL INFORMATIONSold as 1 panel only, mesuring 54" width, available in 84", 96" 108" length.With one bonus rope tieback.Made of 100 % high quality soft polyester and white color.KEY PRODUCT FEATURESMildew resistantFade resistantWaterproof effectSlive Rust Proof GrommetsRYB HOME Curtains panels are handy to use in the outdoors indoors conditions. 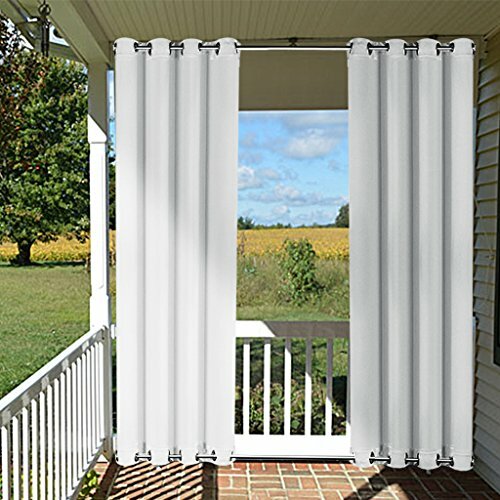 All these features make the curtains durable and high-end.PRIVACYSoft Light-weight voile filters intrusive sunlight, block UV rays and still provide some privacy.Perfect for patio, pergola, gazebo, porch, backyard, country, garden, wedding...EASY TO MAINTIENMachine washableQuick ironying or steam cleaningHINTSRYB HOME isÂ always looking forward to serving our clients with warmth andÂ full ranges of services. Please do not hesitate to contact us if you have any queries. OVER ALLImpress your friends, family and guests with NICETOWN Indoor /Outdoor Solid Tab Top Sheer Curtain Panel.These simple yet elegant panels are a nice finishing touch to any outdoor extension of your home.FEATURESLight filtering: ★★★★★Water Proof: ★★★☆☆Mildew Resistant: ★★★★☆Fade Resistance: ★★★☆☆These 54 inch wide drapes come in 84, 96 and 108 inches long, offered only one color. The fabric is sturdy and soft on the touch. The unique design of tab fits the curtain rod of your choice up to 1.9 inch in diameter. 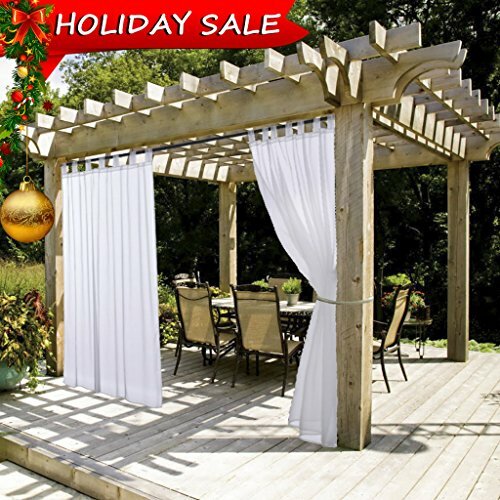 Perfect for front porch, pergola, cabana, covered patio, gazebo, dock, beach home and so on.OUR BRANDInvite NICETOWN products into your home for their form and function, and experience their style, craftsmanship, and value. We travel the world to find the best materials and designs for our products and use the most sensible manufacturing methods. We thoroughly test each NICETOWN item and rely on feedback from our customers to help us deliver the highest quality. With a selection that continues to grow, the NICETOWN brand is set to become a game changer in your shopping cart and part of your lifestyle. Description: This linkable design led curtain light is composed of the controller and main curtain light two parts. 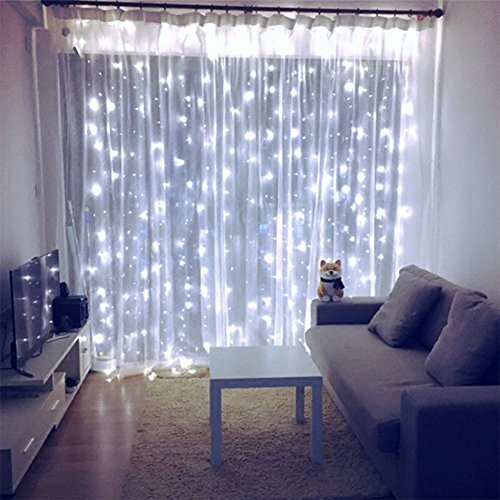 Features: 1.The main curtain lights can be used as one, and multiple curtain light also can be linked one by one, change to be a different length of curtain light according to your need. 2.Multiple curtain light after connected can be controll by the same controller synchronously. Specifications: 1. Material: PP & TPR & CR-V steel 2. 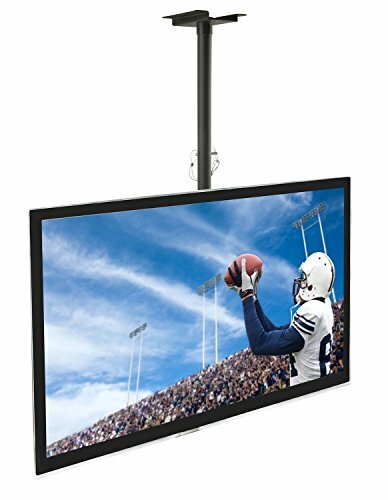 Horizontal Length:9.8ft/set x 1 3. Vertical height: 9.8ft 4. 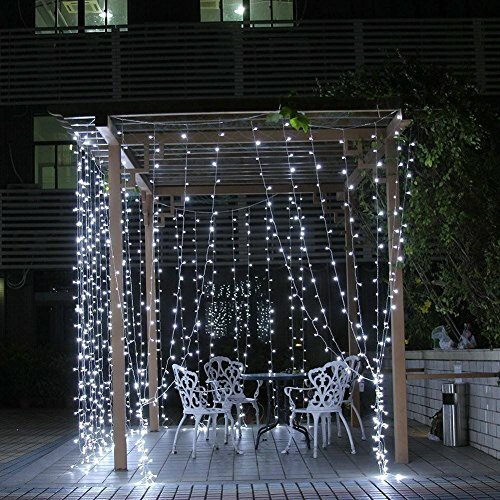 LED Quantity: 608 PCS/set x 1 5. Color:White 6. Quantities of LEDs of each strand: 19PCS 7. Quantities of strands of each Curtain: 32PCS/set 8. The controller has 8 different lighting modes:combination, in waves, sequential, slogs lo, chasing/flash, slow fade, twinkle/flash, and steady on. 9. The cord length between plug and controller:5ft 10. Voltage: 110V HANG UP TIPS: Hanging up the whole set light first and then unraveling each individual strand, it will be easy. When you hang it don't undo the strands of lights until you have the main wire up and ready. This will save you a lot of headache because it will tangle easily. Also, when you have to take it down you can wound up each strand and taped it up to avoid tangles and make it easier for use next time. resolution 16x22 pix. Pitch - 18cm. 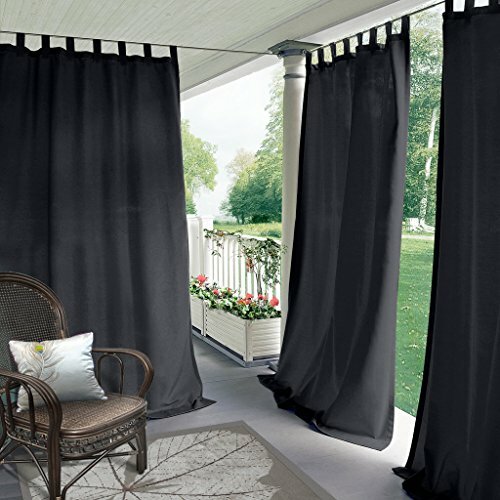 Compare prices on Outdoor Curtains 110 at ShoppinGent.com – use promo codes and coupons for best offers and deals. Start smart buying with ShoppinGent.com right now and choose your golden price on every purchase.